On 2 November 1997, football featured on The Simpsons for the first — but not last — time. At the time, this might have been one of America’s most-viewed soccer matches. That day’s episode, titled “The Cartridge Family,” centered on the problems created by Homer’s purchase of a handgun. 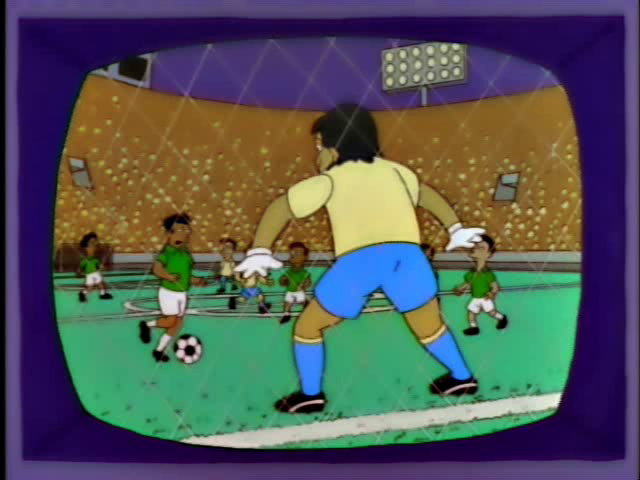 But it opened with the Simpson family attending a match between Mexico and Portugal, lured by the possibility of getting autographs from stars such as “Ariaga, Ariaga II, Bariaga, Aruglia, and Pizzoza!” There’s also an appearance by Pelé, who receives a sack of cash for promoting Crestfield Wax Paper. The Springfield crowd soon gets bored with the match (unlike the announcer, based on Andrés Cantor, who loudly describes the action as the “center holds it! Holds it! HOLDS IT!”) and erupts into violence. It starts when Lenny punches Principal Skinner, but turns into a full-blown riot when Groundskeeper Willie and his Scottish friends jump into the fray. After the violence spreads out of the stadium, Mayor Quimby declares mob rule, which results in Homer getting a gun. Football returned to The Simpsons a decade later with a guest appearance by Cristiano “Ronal-doh”.